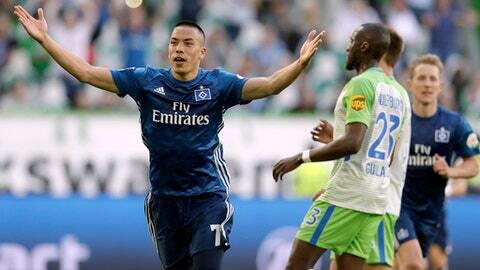 HANNOVER, Germany (AP) United States striker Bobby Wood switched to Bundesliga side Hannover from relegated Hamburger SV on Monday. The Hawaii-born forward is the club’s third loan signing of the summer, after Kevin Wimmer (from Tottenham) and Takuma Asano (Arsenal). ”I had very good talks … and know what the club intends, what kind of football should be played and where I fit in with that. My gut feeling told me it is the right decision,” Wood said. He joined 1860 Munich’s youth setup in 2007 and made his debut in the second division in 2011. The forward moved to Union Berlin in 2015, and then Hamburg in the Bundesliga in 2016. Wood’s time in Hamburg did not go to plan, scoring just seven goals in 52 league games. Last season he managed two as the side was relegated.